Unilever Food Solutions Sooo Pinoy Food Trip in Cebu last stop for the first day is Mooon Cafe Mexican Restaurant in Cebu IT Park The Walk Lahug. The Cebu IT Park provides diners a beautiful environment through green landscape to complement the high-rise BPO infrastructure and has become a lifestyle destination in the Cebu with dining, recreation, wellness and retail outlets accessible by Cebuanos. 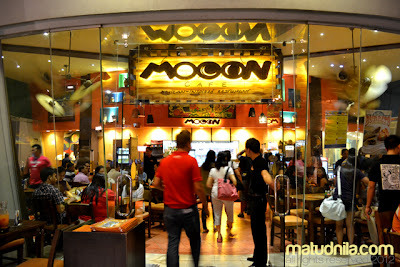 Pages Holdings indeed choosen the ideal location of Mooon Cafe in The Walk IT Park. Though this is not the showcase of Mooon Cafe for UFS Sooo Pinoy 2012, Mooon Cafe's Pork Sisig is still the darling among the Food trippers paired with plain rice. 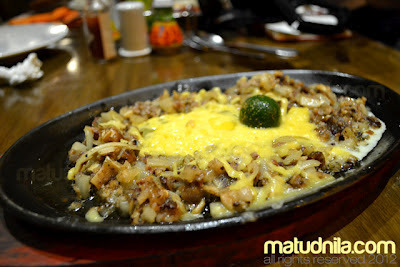 Mooon Cafe Pork Sisig is named one of the best Sisig in the country by UFS Sooo Pinoy 2011 and it really deserves the feat. Moon Cafe Pork Sisig served in sizzling plate main ingredients are chopped pork mask and liver sauteed in onion, chili hot sauce, calamansi juice, and topped with cheese and fresh egg. 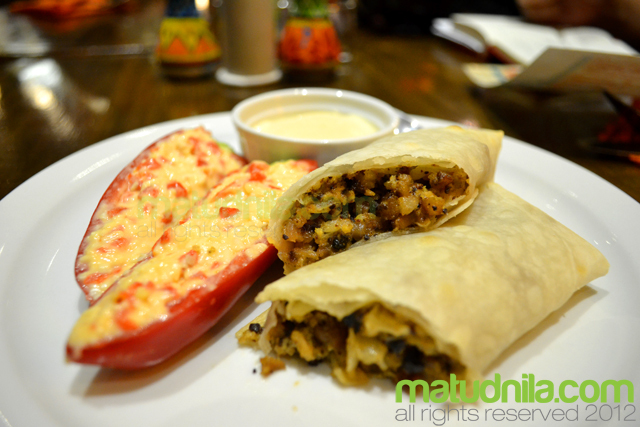 Mooon Cafe is a Mexican themed restaurant in Cebu but with a Filipino Delicacy influence, their Sisig Burrito with Red Pepper Cheese Pimiento is a combination of your favorite Filipino delicacy and scrumptious Mexican staple priced at 140 pesos. Other Authentic Mexican offering from Mooon Cafe are Chimichanga, Quesadilla Uno, Quesadilla Veracruz, Beef Burito, Campesinos, Nacho de Salsa, Beef Taco, Fish Taco, Burrito Pescado, Campesinos Jalapeno, Chicken Flautas, and Nacho Spinners. Uniliver Food Solutions Sooo Pinoy Campaign aims to feed our love for Filipino food, Know more about Sooo Pinoy campaign by liking the Sooo Pinoy page on Facebook or follow @SoooPinoy on Twitter. 0 comments: on "Sooo Pinoy Food Trip Cebu: Mooon Cafe Mexican Sisig Burrito"